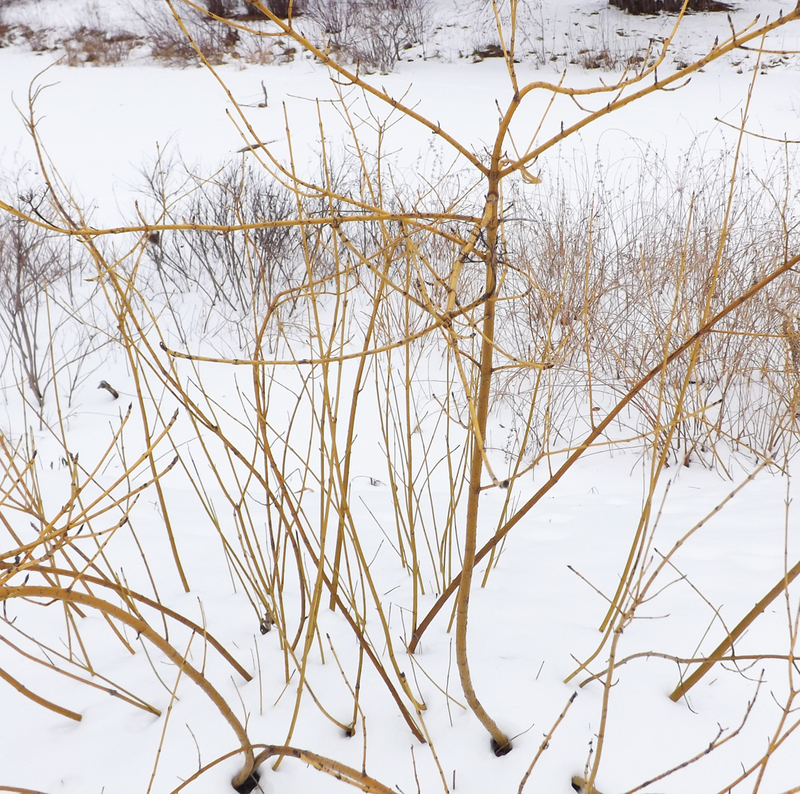 Putting the lie to the stereotyped drabness of Boston winters are a few gaudy treasures in the arboretum. I trotted the hills — so you don’t have to — in the gelid, windswept park. As it turns out, the Arnold folk put a little but not too much effort in year round color as points of interest. 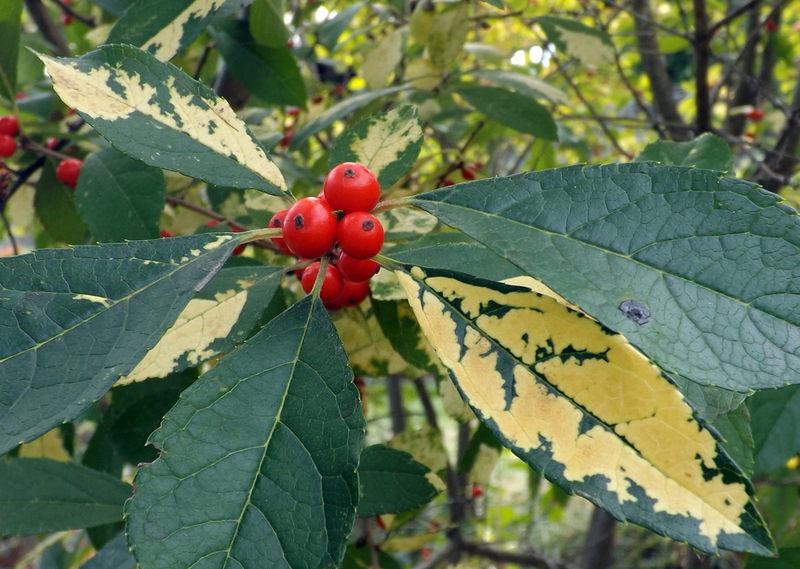 There are areas lined with dogwood bushes, drab when the longer-lived flowering shrubs are showing off, but striking in their yellow or red branches when leaves are gone. 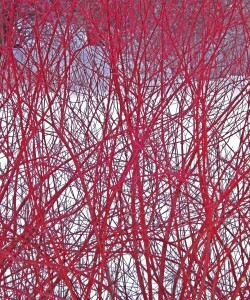 Otherwise, red is the color that dominates above the snow and in the bitterest wind. If you’re up for it, and be aware there were joggers in shorts with purplish legs, you can find lots of spots of color on the main road (Meadow becomes Bussey Hill becomes Valley becomes Hemlock Hill). 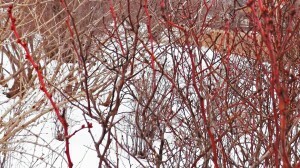 Tall European cranberry bushes are flush with fruit. Another of the many colorful viburnum bushes. peeks of the Blue Hills. 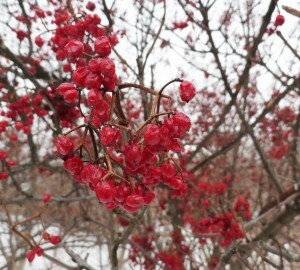 A few bushes, like this Poiret barberry, have delicate fruit. 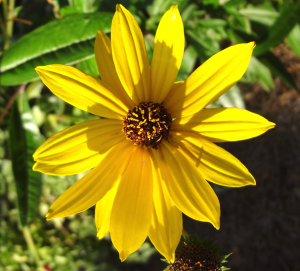 …and a little subtler in yellow. Some of the less splashy visual include the Korean Yodogawa azalea, which look like star anise on the bush. 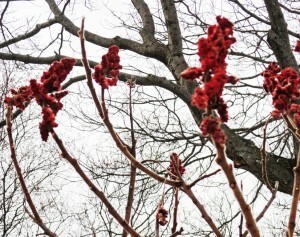 Not so, there were a few smaller maples and a couple varieties of oaks in orange and red, but very few. Instead it was subtle again. The trick before the garish displays is look down, not up. Every path has wee delights. The purple beautyberries are petite drama queens. Head up Bussey Hill and look right next to the path to the Explorer’s Garden. 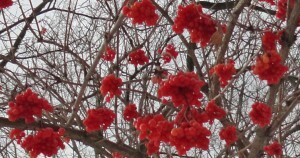 The Chinaberries are in prolific clusters on Valley Road. 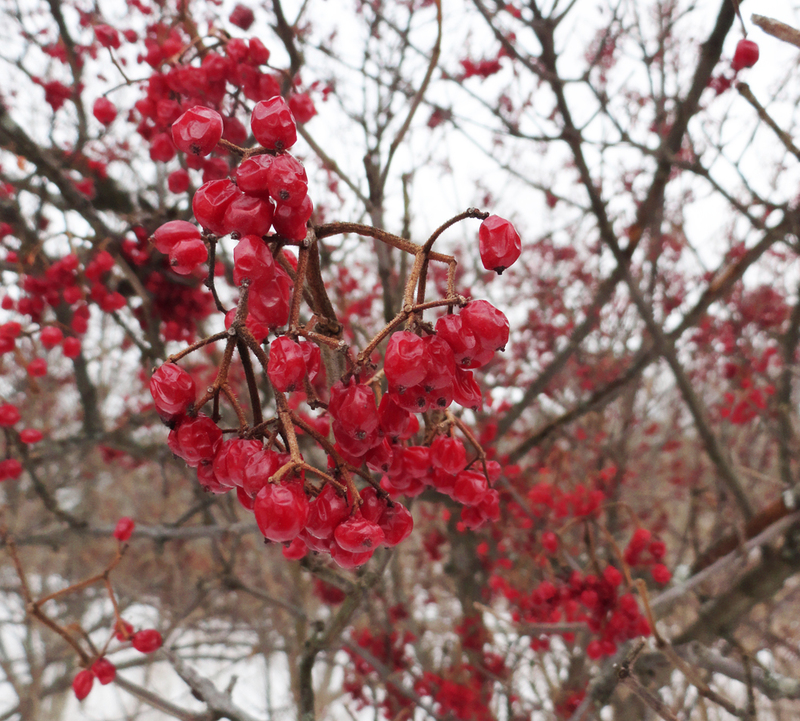 There are deceptively similar berries on the red dogwood bushes in the Leventritt Gardens. 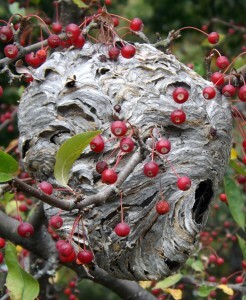 A one-off on Willow Path was a basketball-sized bees’ nest. It’s only a few feet off the trail. 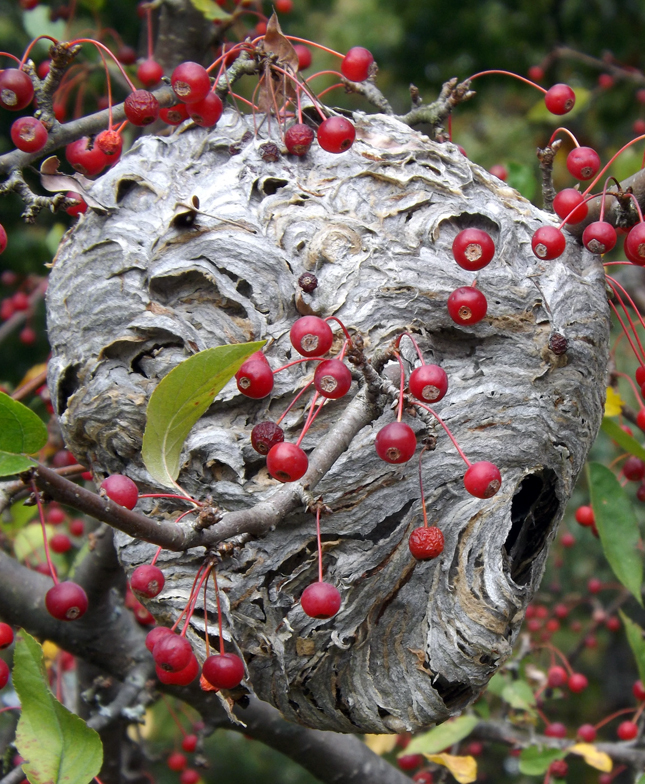 You can’t miss it because of several warning ACTIVE HIVE signs. 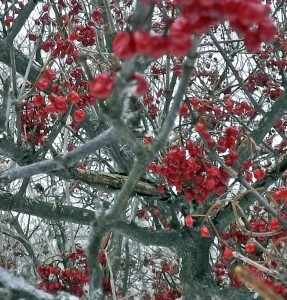 The dwarf tree it’s in (long-thorned hawthorn) has it all decked out for the holidays. 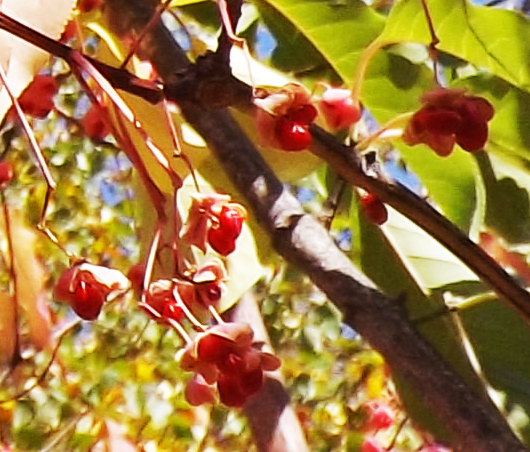 Midway on the path up Bussey Hill on the opposite side from the beautyberries is a set of euonymus, with flower-like berry coverings. 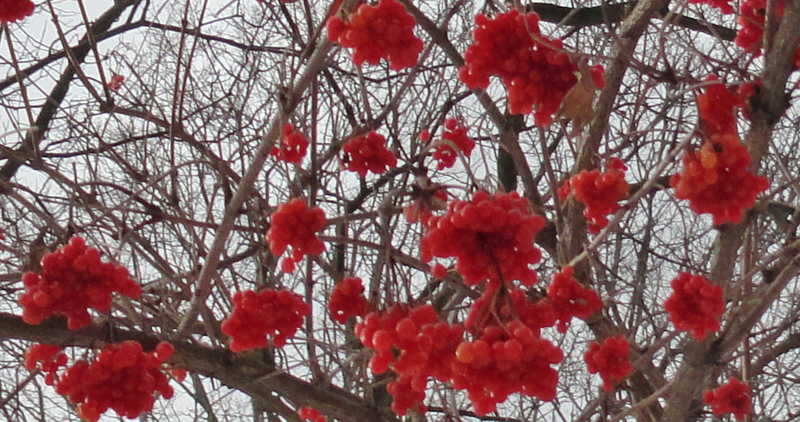 In the Leventritt Gardens, the delicate looking winterberries are like holly’s sophisticated sibling. Make sure to follow the Blackwell Footpath. It’s the former home of an urban wild and still has occasional foxes, hawks and turkeys. This is also the season to marvel at the down of milkweed. The uxorial unit led the trip to South Carolina. She comforted a recently widowed girlfriend from college days, enjoyed a couple of days with the godmother of one of our sons, and had several days with her elder second cousin. I arrived two days before we drove furniture from her late parents’ house back to Boston. There were the clichéd and expected, plus a colorful flora surprise. Thick accents and thicker grits were parts, as were tall biscuits (White Lily flour certainly). Thigh-high cotton fields in full fluff lined the roads. Every town had at least one Piggly Wiggly. Nobody cut off another driver or honked at anyone slow off the traffic light. In fact, slow was just fine. People held doors for each other and said, “Ma’am” and “Sir” without irony or sarcasm. A nice extra was only a quarter of a mile from her cousin’s house in Hartsville. Kalmia Gardens is a combination arboretum with labeled plants and a formal Southern garden and a boardwalk beside the cypress swamp that is Black Creek. As so many Southern splendors, this is a rich woman playing with her money for visionary pursuits on a local level. In this case, it was not to name it after herself or her husband nor to restrict it. She gave the resulting property to Coker College, which was named for her wealthy family. She fixed up the neglected, trash heap of land (rather paid people to do that), designed the walks, plantings and more. It has been open and free to the public since 1935. Coming down from Boston after our slush fest on top of our usual brown fall, I was pleased to see so many plants still in bloom. Amusingly, the specimen sugar maple has yet to turn color, while ours are long defoliated. My snaps from the walk around are here. My wife’s cousin has not been down to Black Creek, although she did host an engagement dinner on the grounds above. It is 94 steps down to the uneven boardwalk…and 94 steps back up, unless you lie down and die. We thought it was worth the stairs. Sure enough, we did snort some lilacs in the Arnold Arboretum. Sons 2 and 3 also shuffled with me around the bonsai house in the year’s most crowded day there. However, we were there for something else. Uxorial unit Cindy joined her regular acoustic jam crew at the largest of the three ponds for an afternoon music fest as part of the program. 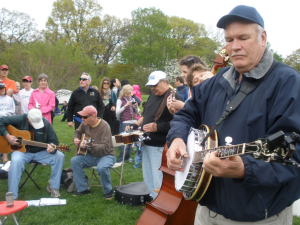 Normally, the Sometimers (sometimes the show up and others…) are at Gerard’s restaurant/bar/convenience store in Dot in cold seasons and at the Jamaica Pond band shell in nice weather for Sunday jams. This was about the same time, but a command performance at an unusual venue. As usual, the Dobro resonant guitar brought a welcome twang. Normally a single is in the group, but a second showed up yesterday. Uxiorial unit, a.k.a. 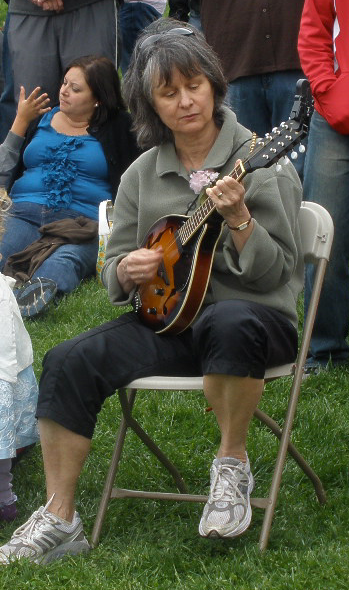 Cindy, handled one of the mandolins. 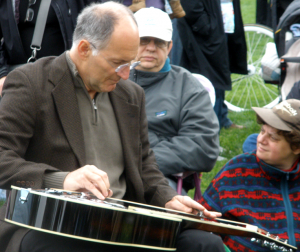 The circle of musicians took turns suggesting and leading the songs. 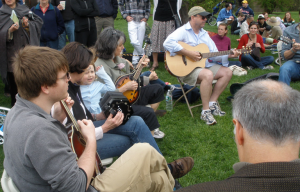 Of course, there’d be no acoustic folk jam without the requisite banjo. The second Dobro was a welcome surprise. Let there be sing-along and clapping accompaniments! 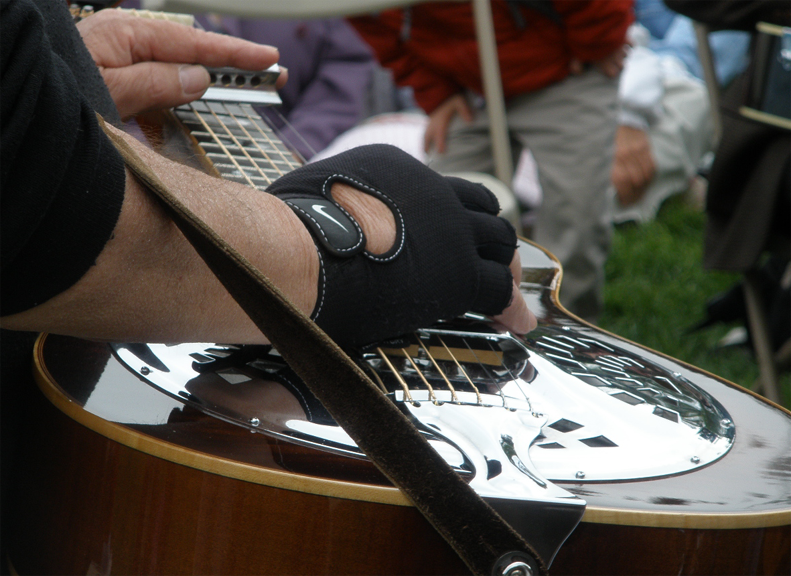 And there were a variety of stringed instruments, as well as a concertina. Upright bass, guitars, mandolins, dobros, even a uke were in the mix. Likewise, a sundry audience joined the dozen or so pluckers, strummers and squeezers, singing the folk, country and occasional protest or rock tune. Toddlers beat tunes on their parents’ heads from perches on shoulders. Others little and big hummed, sang or vocalized nonsense as befitted their knowledge and age. The Sometimers pronounced it a success. After a glance, my uxorial unit declared the backyard looks like a field of Marshmallow Fluff®. That’s how winter should be, and how it is in my childhood recollections. We’ve been a week with scant new snow. We had a pathetic dusting last night, sky dandruff. Yet, the air has been colder than average and not modulated by that famous ocean effect that Boston gets. Our 18 inches up on this hill stays a solid foot, even after several sunny afternoons. For much of my childhood, I spent vacations and for a few years lived in the Eastern panhandle of West Virginia. To my memory, snow that came stayed. Romney is in the mountains and on a plateau surrounded by them. 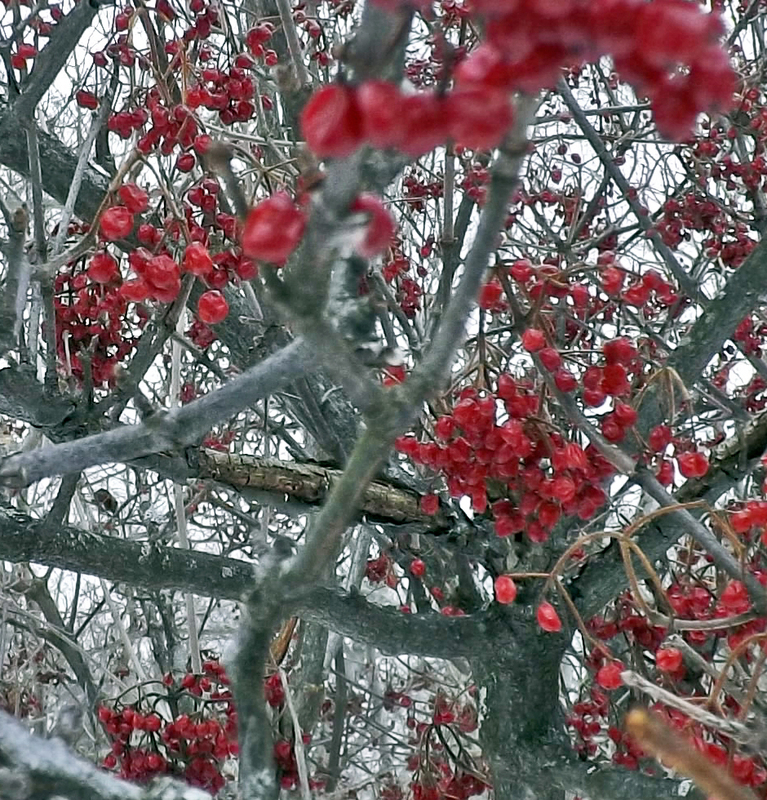 The huge apple orchards and corn fields overlooking the Potomac were white from the first flakes, on and on, with regular new snows. Normally in-town snow in Boston, if it deep enough to cross-country ski in, stays that way one to three days. Temperatures above 30F, bright sun, and no new snow quickly reduce the good stuff to intermittent grass decoration and junk that sticks to skis. 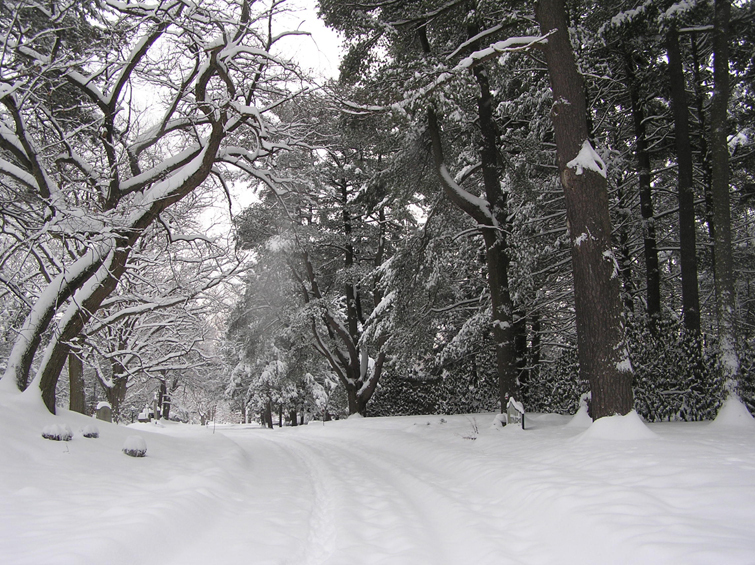 I’m quick to grab the skis (sometimes snowshoes instead) and head to one of my Boston ski resorts — the Arnold Arboretum, Franklin Park’s golf course or the nearby Blue Hills Reservation in Canton/Milton. 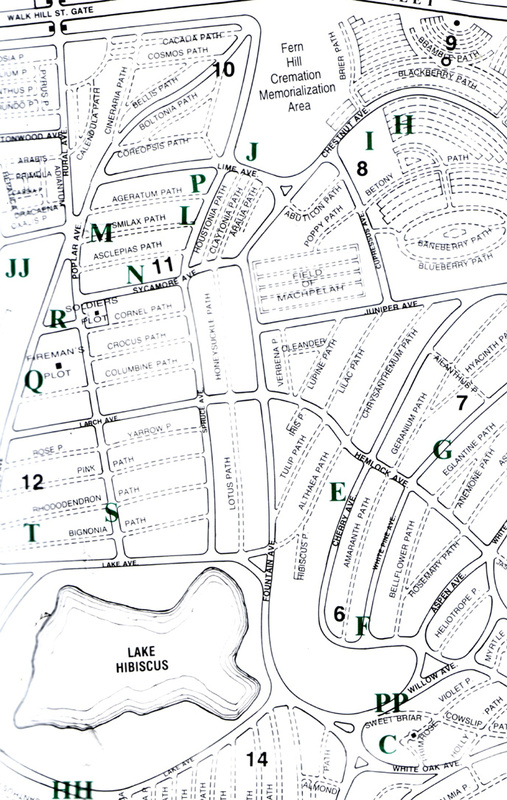 Alas, I used to walk to the Forest Hills Cemetery when we still lived in Jamaica Plain, but two years ago, the management there got grumpy, nasty and non-accommodating. It’s not a huge deal to drive 45 minutes or even a couple of hours to get to a bona fide cross-country course. They have groomed trails, warming houses or huts, places to pee and such. They do charge say $20 a person, but the big thing is that they are OUT THERE. It’s fabulous to ski Boston. I have an odd pride in being able to do so, even hitting someplace twice a day or more than one location. So, I’ve been grokking the cold weather keeping the deep snow for my amusement and sport. Tomorrow again will be bitterly cold — more obvious in the arboretum or particularly on the Devine golf course, which only means faster skiing and no slogging in the gummy stuff. If global warming means hotter summers and colder winters, at least the second part keeps my fluff deep and hard enough for play. Bring it on and keep it on the ground, if you please. One of our in-town ski resorts may require stealth access. From Woodbourne, we are within walking distance of three undesignated cross-country ski areas — Franklin Park’s Devine golf course, the Arnold Arboretum and Forest Hills Cemetery. 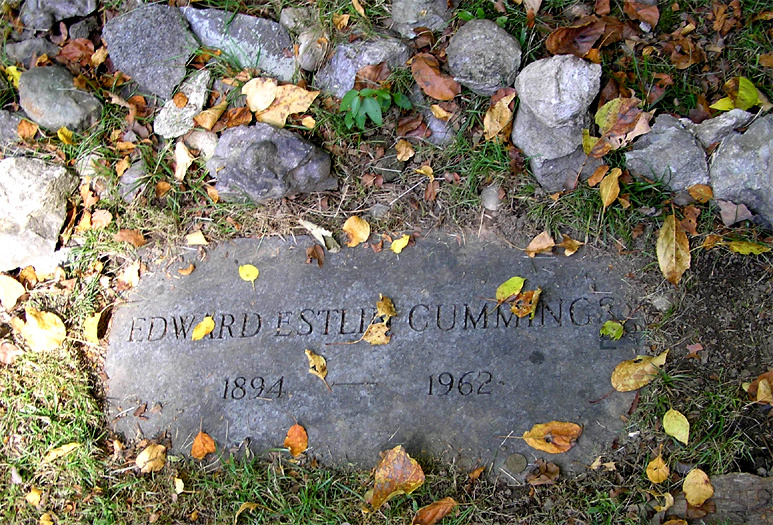 The city owns the golf course and the dirt and roads of the arboretum (the plants belong to Harvard), but the graveyard has been private since it opened in 1848. 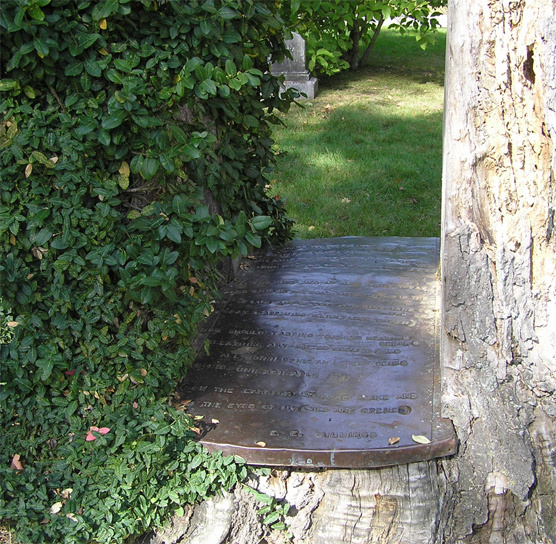 However, FH is the second U.S. garden cemetery, meant for more than corpse storage. Unlike the nearby necropolises, St. Michael and Mt. 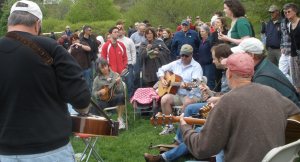 Hope, FH was a park from the beginning, meant for contemplation, passive recreation and such human bonding as picnicking. 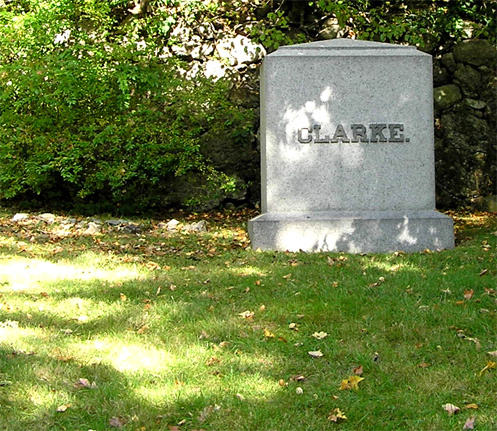 It is also a sculpture garden with works by some of the nation’s most noted stone cutters and metal artists. Pic Click Trick: Click on the thumbnail for a larger view or see a few more here. For a quick spin, we’ve skied in FH for many years. The arboretum can seem like 128, with all its Brooklinites and surburban types unloading from their SUVs. The golf course is farther, but definitely less crowded and equally as rural in the snow. FH is right there and when the sidewalks haven’t been cleared, it’s an easy ski from Woodbourne, no car needed or wanted. (Cue threatening music.) A couple of snows ago over the end-of-year holidays, we got the bum’s rush from a control-freak security guard. He wanted us to leave and not bring our skis back. The snowshoers, cars, trucks and bikes were okay, but no ski, no way. He insisted skiing was forbidden, not passive recreation (did he think they had tiny motors hidden underneath?). We skied around and avoided him, but he looks like trouble. Judgmentally, I figure him to be ex-military, but Army and not Marine from his unkempt sideburns. He was definitely a rules-are-rules type who will take charge until there is a superior officer at hand. I can’t say I was amazed after several conversations along that line with a neighbor who has spent his career working there. He says when the crew puts the snowplows on its Jeeps, the operators hate cross-country skiers. The running joke over there is that cross-country skiers make nice hood ornaments. No skier has ever been hit or run into a Jeep or caused any accident. The cemetery has lots of traffic — motor vehicles, walkers, runners, dog people, cyclists. Anyone operating a plow has open vistas making it easy to see any of those visitors well in advance. Skiers there all seems to pay attention and there’s next to nowhere that a hill would let a skier travel fast onto a road. Unleashed dogs are far more common and more likely to cause problems than a couple of skiers. The point is that the employee folklore disses skiers. FH management would be stupid to ban skiers. After all, they are in the business of marketing their plots, which includes keeping FH a pleasant place to spend time, maybe a very long time. I had time to visit the princess trees (Paulownia Tomentosa) again this afternoon. The original on this funky Asian delight is here. My uxorial unit and a mutual friend had stumbled under a few more and gotten caressed by lavender blossoms on the way. So here are the flowers and a slightly annotated map. 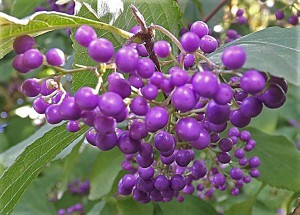 The blossoms are blue or lilac, often high in a mature tree. They are bell-shaped and hang down like foxglove. 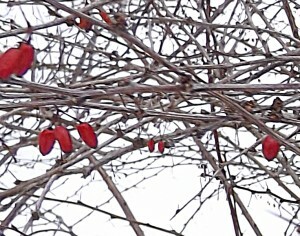 There are hundreds of them in a tree. They tend to fall in large numbers. There seem to be about a half dozen of these trees in the Arnold Arboretum. They don’t rate a listing on the interactive map. However, for your ambling and gawking pleasure, look at the purple Ps on this version. 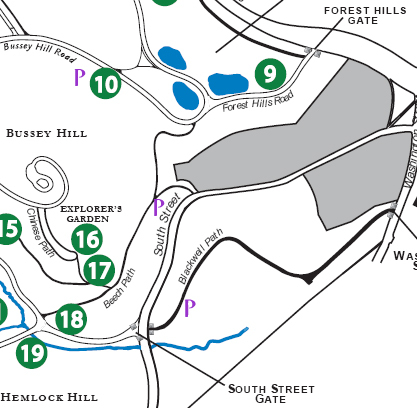 There’s one on the gravel walkway between the Forest Hills Station and the South Street Gate, two on a dirt path East off Beech Path, and three up the hill South from the middle of the lilacs. 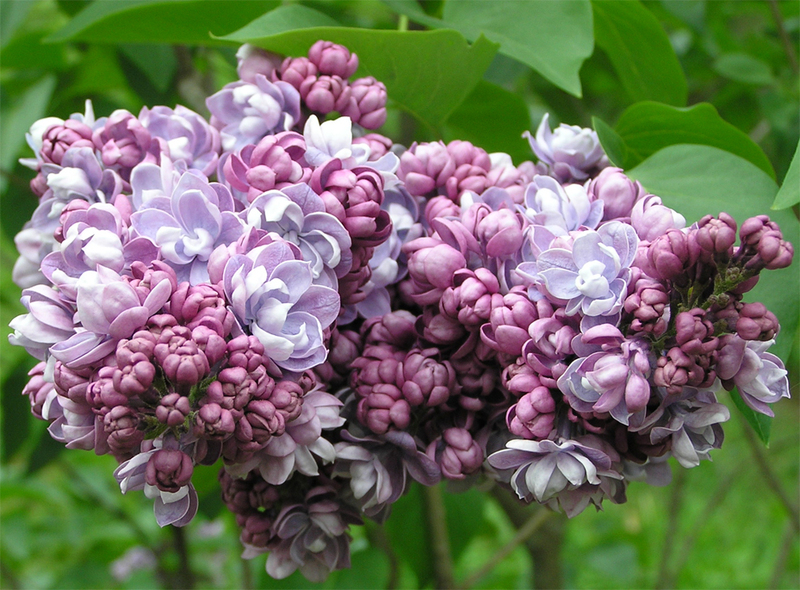 Check in mid to late May (around Lilac Sunday) for the profusion of blossoms. 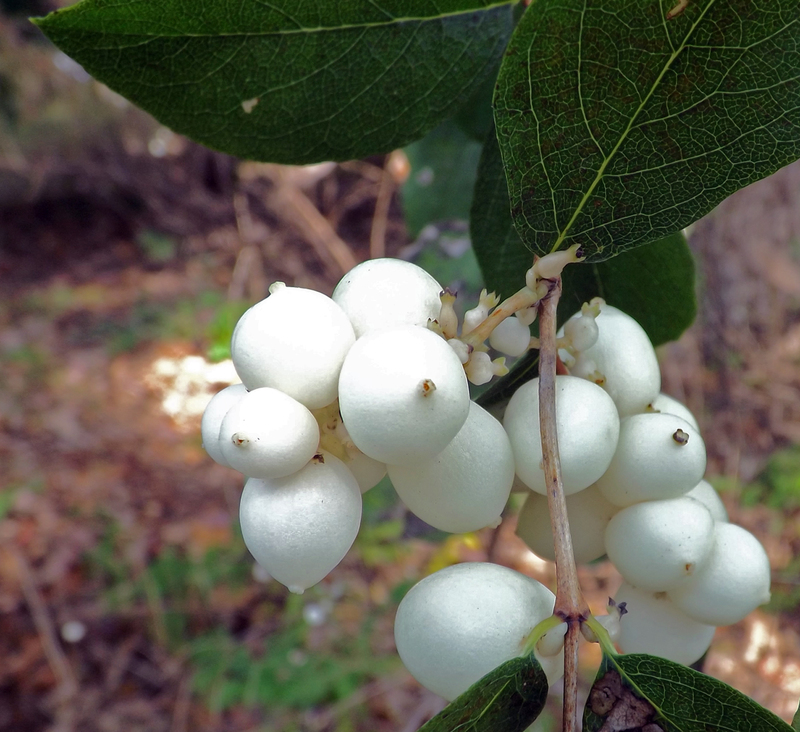 The latest treasure we found at JP’s Arnold Arboretum was a tree that has long been important to the Chinese and Japanese, and one that made its own packing peanuts hundreds of years before Styrofoam™. I’m one of those tag readers and feel a cheap thrill when I discover something like the PAULOWNIA TOMENTOSA. Rationally I know that this is akin to reading a road sign, but hey I’ll take my pleasures as they come. There are only a few of these 50-footers there. One is on the gravel path from Forest Hills Station. Another is just east of Beech Path overlooking the state labs. 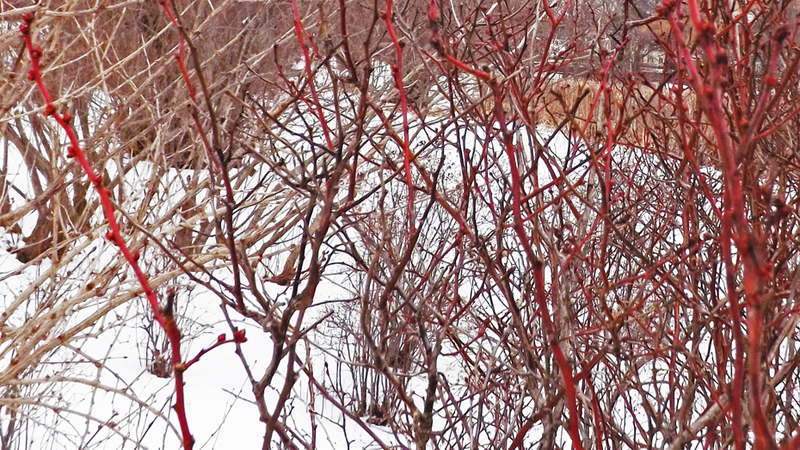 A few are on the hill above the lilacs. These are not important enough to be listed on the map. On the other hand, it has a fine history and present..plus click on those seed pods! That’s what first caught my eye. Then looking way up, the pale violet bell-shaped flowers were both subtle and profuse. They look like foxglove (digitalis). The leaves are worth mentioning too. They are perhaps a foot long, broad and ovate. 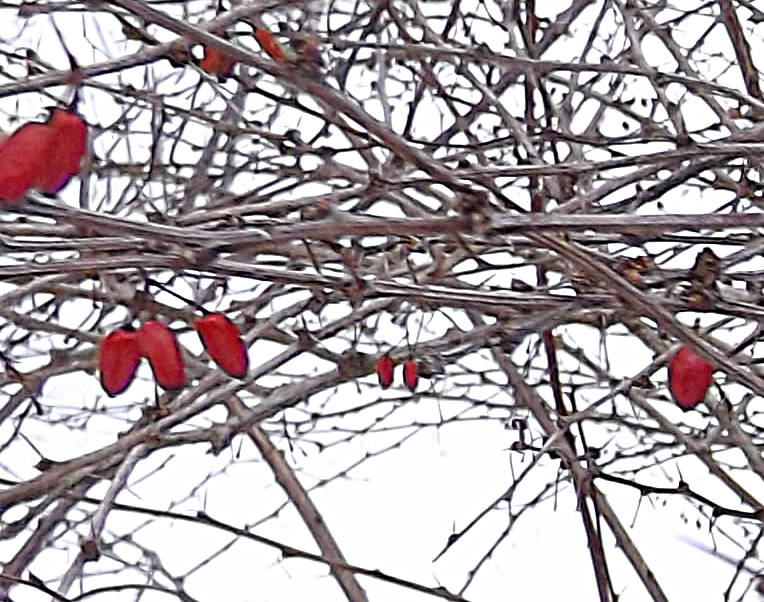 They seem to belong on a swamp shrub instead of a sizable tree. 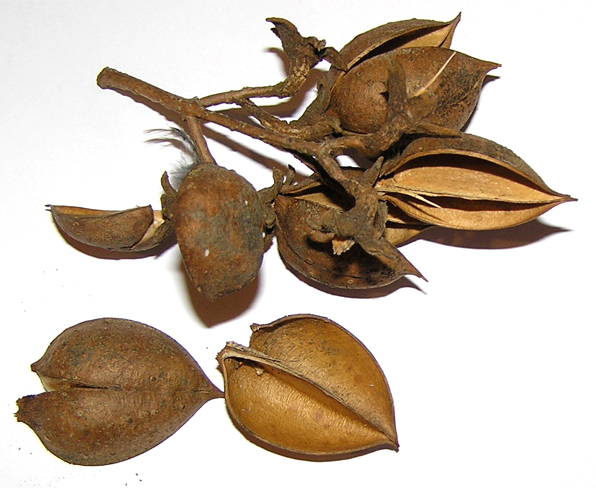 Once I found its copper label, I wanted to know what the deal was with those pods and why weren’t any seeds around amidst so many of them? The Pods. 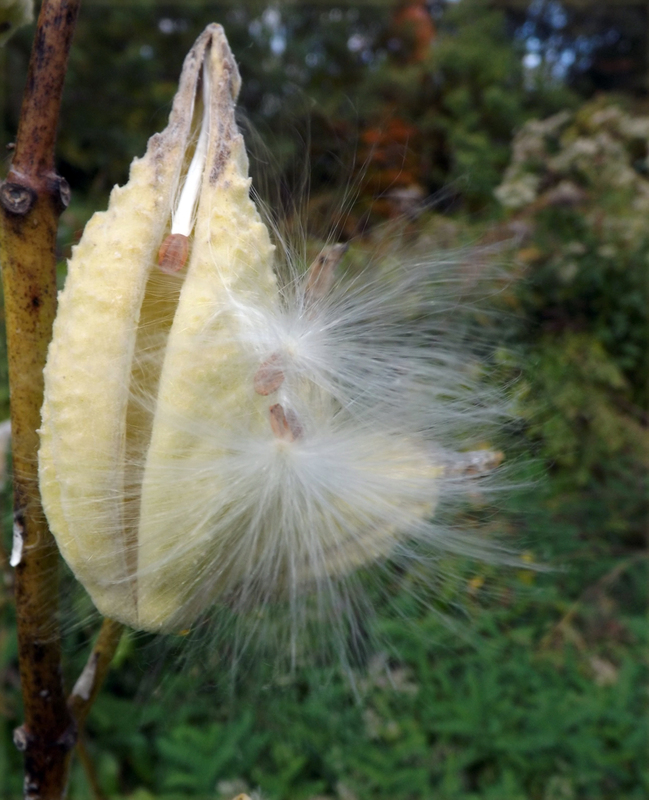 The seed pods have their own tale. The tree is native to China and cultivated widely in Japan as well. We are at the North of its range and apparently the many hundreds of tiny seeds in each pod are not very efficient. They should be capable of germinating in the spring, but you don’t see babies popping up. On the other hand, the seeds like warm weather and in parts of the Southeast, this is an invasive tree. It was introduced as an ornamental and well, you know how that works. The pods turn out to be great protective packing material. Merchants shipping valuable and fragile objects from Orient to Occident used these for centuries in their crates. The Name. Paulownia is an honorific to someone who basically had nothing to do with the tree. When she was a duchess, the daughter of Russia’s Tsar Paul, Anna Pavlovna (1795-1865) of the Netherlands got the honor. She later became Queen of the Netherlands. In case you’ve forgotten you terms, tomentosa means furry, as in the backs of the leaves. The Culture. It is also known as princess tree. Traditionally on the day a daughter is born, the parents plant one. It grows rapidly and matures about the time a young woman is of marrying age. Its wood is highly prized in both China and Japan for cabinetry. She receives an elaborate cabinet as part of her coming of age. 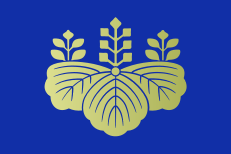 The tree is viewed as important enough that it is a feature on the seal of the Japanese prime minister. 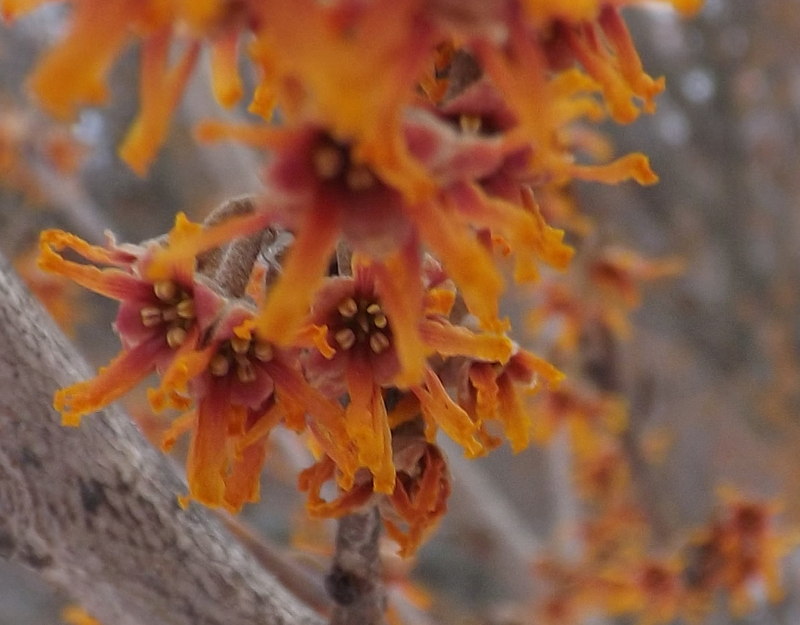 The arboretum includes the tree in its history of how Frank N. Meyer came to bring them from China a century ago. The flowers are abundant in late May. They are remarkable for their delicate coloring, their being out of reach, and that they tend to fall by the ones and dozens as you pass. By the bye, despite the seeds’ seeming infertility here, propagation can be by root or greenwood cuttings. Young, unfolding leaves can also create a new Paulownia. Finally, after being harvested, the tree invariably puts up a new main trunk. 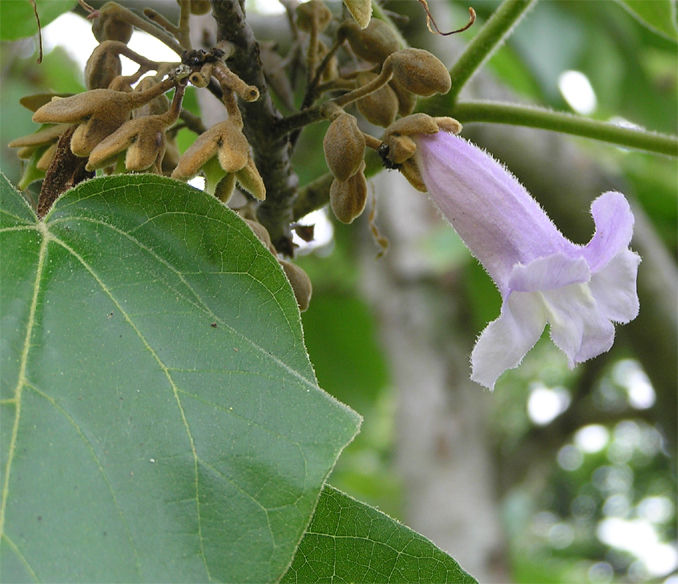 Except for the floral period, Paulownia isn’t showy. It’s trunk is pretty dull too. It’s a scholar or poet though, with a lot at work behind its quiet appearance. While the paths rumbled with Russian conversation, we otherwise staid WASPy types plunged our whole noses and cheeks into pungent bunches. Many times, the private contest was to determine which lilac was broadcasting the suddenly powerful scent. We were all shameless in our olfactory revels. On the way back up the Centre Street hill though, we walked abreast with the evil Ben, the creature who has already defeated his mother. I judge him to be six, possibly early seven. She has ceded control of the family to her elder of two sons. Unimpressed and uncowed, Ben tossed more. Then he seemed to remember his four-year-old brother…as a target. He picked up several rocks and threw one after another at his sibling. We hurried uphill, thorough embarrassed by the failed parent. Bribing your elementary-aged child not to hurt his younger brother? Cut me a very thin slice of that bologna. Having raised three boys, now adult, 17 and 14, I was aghast. I never hit my boys, but I did not let them throw rocks at anyone and I absolutely never paid them to human and humane. WM seemed to be about 35. We figured it wouldn’t have helped in the slightest to give her a 76-second parenting lesson. She’s going to have it hard enough when Ben boy gets to be 15. On the other hand, the lilacs were great. 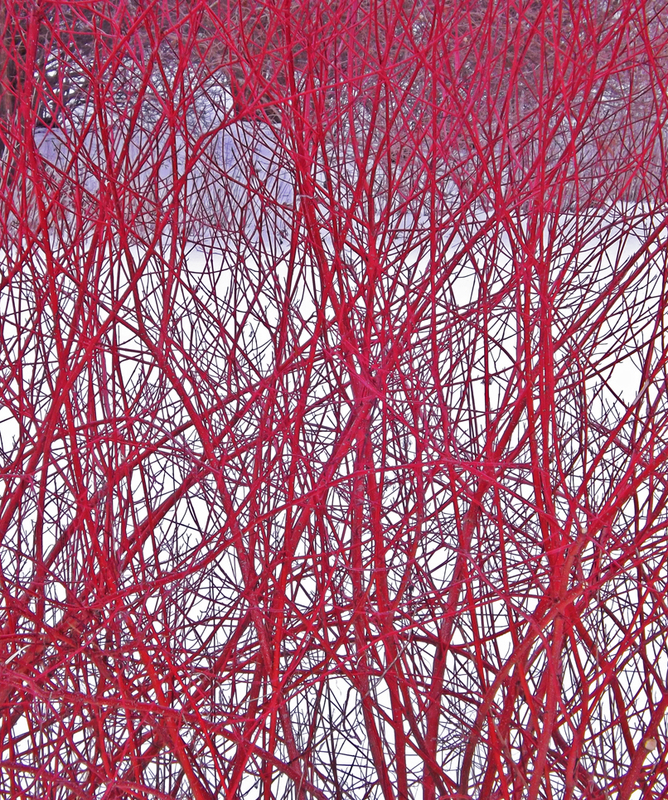 You are currently browsing the archives for the Arboretum category.